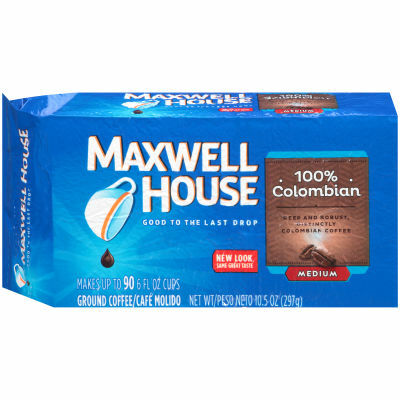 100% Colombian Ground Coffee Experience the deep and robust flavors of a 100% Columbian Ground Coffee from Maxwell House. This coffee is a medium roast that delivers a deliciously balanced taste and flavorful aroma in every sip. Good to the Last Drop Revitalize your senses and refresh your mind with this medium roast ground coffee, vacuum packed into a 10.5 oz. package that retains full freshness and flavor. Perfect for use in all coffee makers, this package makes up to 90 cups of coffee that can be enjoyed morning or evening.